Good news for finance managers in Ford dealerships: Automotive Lease Guide said that if it had a class in how to cultivate a higher residual value, Ford Motor Co. could be the star pupil. A higher residual creates lower monthly payments for customers because in leasing, the customer in effect borrows the difference between the upfront cost of the vehicle and what it's predicted to be worth at the end of the lease, also known as the residual value. ALG, of Santa Barbara, Calif., said the average Ford residual value gained $2,420 comparing its January-February 2010 guide to the year-ago period. Hypothetically, that amount could go straight toward lowering the consumer's monthly payments. Matt Traylen, ALG's chief economist, said in a Web seminar last week that in ALG's view, Ford is doing everything right in terms of residuals. Ford's new products - notably the new Ford Focus and Ford Taurus - are well received, and the new-product pipeline is full, with new cars such as the Ford Mustang and Ford Fiesta. "People like to know what's coming out," he said. Ford has conservative plans for production and sales volume, which means the automaker is less likely to be forced into cutting prices to reduce unsold inventory. 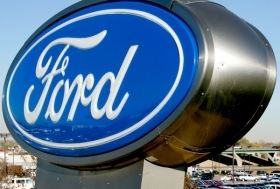 Customers give Ford high marks for "perceived value," in an ALG survey. Traylen said that over time, customer perceived value correlates closely with changes in residual values, positive or negative. He said BMW and Honda are making some of the same choices that support residuals. Another thing that helps is that all those brands avoid cash incentives, which have a worse effect on used-car values than other forms of incentives, like lower interest rates or lease deals. ALG's Perceived Quality Survey also shows a potential piece of bad news for Toyota Motor Sales U.S.A. Inc., because the Toyota brand fell in the survey more than any other brand. For now, Traylen said ALG is just keeping an eye on Toyota and the firm hasn't cut Toyota residuals. If Ford is the star pupil, Chrysler, Jeep and Dodge skipped some lessons, especially when Chrysler was trying to avoid bankruptcy last year. To move the metal, Chrysler put a lot of money on the hood, like cash rebates up to $8,000, and pushed a lot of fleet volume. For example, Traylen said in the Web seminar that fleet sales accounted for 90 percent of sales volume in some months for the Chrysler Sebring. As a result, it has, "one of the lowest resale values in the industry," he said. ALG said that only four brands in the industry had lower predicted residual values in ALG's January-February 2010 guide vs. the year-ago period: Chrysler, Jeep and Dodge, plus Pontiac, which is being discontinued. Jeep's average residual was down only $36, but Chrysler's was down $167 and Dodge was down $398, ALG said. In its defense, Chrysler Group said in a statement that it expects to renew or refresh 75 percent of its lineup by the end of this year. The flip side of that is 75 percent of the Chrysler Group lineup is at the middle or the end of its cycle, so lower used-car values are to be expected. Chrysler also said that even though its residuals are still down from a year ago, they are on the increase. The company said, "Our residuals have been rising the last two periods and based on early conversations with ALG, we expect that trend to increase dramatically as the new products become available for sale."